Being frugal is all the rage these days, or so the cool kids tell me. More and more people are resorting back to the “old days” when every scrap of food was stretched, hand-me-downs were the norm, and credit cards were non-existent. This movement is leading to more and more people aiming for sustainable living and financial freedom. I am personally so happy to be a part of this awesome frugal living and minimalist lifestyle movement. Amidst all of the fantastic frugal choices being made every day, however, there are some major mistakes being made. I know because I personally made them while striving to be more frugal. The thing is, there are actually times when you need to stop being frugal and start being realistic. I still consider myself to be a recovering shopaholic. Shopping clearance sections for items I didn’t really need in the first place was my shopping method of choice. Now I see frugal as being more about sustainable, long-lasting purchases instead of what will save me money short term. When there is a coupon or sale, absolutely take advantage of it! Don’t look at shopping as a sport to “save” on. Instead, see purchasing clothing as a long-term investment. When I was at my biggest “crunchy” phase, I was washing my hair with baking soda and water. It definitely gave my hair a good clean and made it super soft. But, over time my hair started drying out and getting brittle. It is important to remember when it comes to caring for your body. You definitely don’t have to spend high amounts of money on products that claim to cure every flaw, but know that sometimes spending a little more can go a long way in helping your body be it’s healthiest. Here are some of my favorite options. Coupons are only beneficial to you if they are items you needed in the first place. Taking the time to double your coupons and get all of your best rebates so that you can buy 20 bottles of shampoo when your bald isn’t being frugal, it’s actually wasteful. Dosh – Dosh is an app that links up to your credit cards (or qualifying debit cards) and gives you money back on purchases you make. Get $5 for signing up, plus $2 per added card. If you are trying so hard to save money that you refuse to take yourself or your family to the doctor, there is a good chance that you are being too frugal. I’m not saying we should all be running to the ER for every cough or sniffle, but, be wise about your limitations. Don’t be like that family on Extreme Cheapskates that did their son’s dental procedure at home. I am a firm believer that our body is our most important tool and it needs to be treated as such. This doesn’t mean buying organic all the time, but instead of saving yourself tons of money on all the highly processed items you’ll find in coupon books, try finding the best deals on fruits and vegetables. Better yet, build your own garden. Sure, it’s great to get a sale on day old bread but there comes a point when purchasing expired products becomes dangerous to your health. This goes double for dumpster diving or rifling through the trash. You never know what types of disease or illness might be lurking in the garbage next to the food you’re scooping out of it. My husband, Tom is diligent when it comes to the upkeep of our home and cars. He is always on top of getting the oil changed for the cars, hitting up the car wash, and filling the gas tank before it gets to a quarter of a tank. I have learned from him how important all of these things are in maintaining a well powered, longer lasting vehicle. Don’t skimp on the small details when it comes to your home upkeep either. Keep long term goals in mind. Taking the time to clean the vents or carpets might cost you up front but will help preserve and maintain the quality of your home for years to come. The same holds true for the outside of the house. Sealing your driveway, replacing broken shingles or siding might be a hit in your pocketbook, but will help your home to continue standing and keep your family safe. If you find yourself holding onto items you don’t need because you spent money on them is a sign you’re being too frugal. When you have family or friends telling you-you are “hoarding” it might be time to take them seriously and take a moment to re-visit the items in your home that you have been holding onto. If you find yourself lying awake at night obsessively worrying about money or having to spend money, you might be like the majority of the world, or you may be living too frugal of a life. Money worries are something that plagues most people, but panicking about having to purchase a new shirt or the cost of having people over for dinner is not something that should be consuming so much of your time. If you find yourself avoiding lunches, coffees and/or family gatherings because you refuse to spend money, this is doing more damage than good. Having relationships is crucial to our survival as human beings. I am a firm believer in giving. If you are going to be wise with your money and have huge savings, then be willing to give. What is the point of having large amounts of wealth if you are not sharing it with others? All that being said, there are definitely great ways to practice being frugal. Get up t a 2.45% interest rate with CIT Bank by depositing only $100 per month into a Savings Builder account! Living below your means could be living with housing expenses less than 25% of your income or simply not spending money you have just because you have it. For example, you don’t need a brand new car, but maybe a more practically priced used one. Getting yourself out of debt is one of the best ways to get more money back into your wallet. See how we paid off $6,000 in 6 months! Ting is a great way to reduce your mobile expenses each month. You could easily reduce your phone bill by OVER half. Try Ting now. This app takes a look at your spending habits and instantly finds different areas where you could be saving money! See where you could be saving. OhmConnect is a company that gives you rewards for saving energy! They offer energy saving events to help you save on the cost of your energy bills and in some states will actually pay you for participating! See if you qualify! This as a good read! There is a difference between frugal and cheap! Thanks Vanessa. I’m so glad you enjoyed it and I totally agree!! 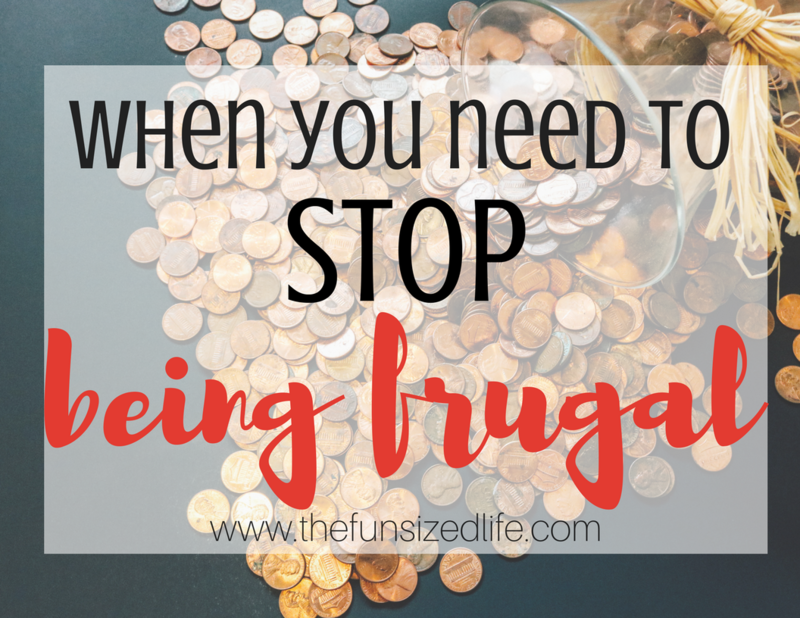 I always thought frugal was something far different than it really is to me!